Opening hours: Shops are generally open from 10:00 to 18:00, Monday to Friday, and from 10:00 to 13:00 on Saturdays. A number of shopping centres are open seven days a week and a few shops open 24 hours a day. There is a lot to see in Krakow, including centuries-old landmarks, lovely vistas, world-class works of art, and stunning curios. The city boasts some of the best art collections in Poland, and museums all over the world envy some of the treasures that can be found here. 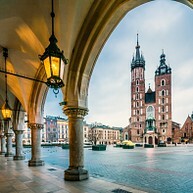 The spiralling twin towers of this ancient church witnessed many of the tumultuous events that have shaken the city of Krakow over the centuries. The top of the church tower is a perfect spot to take some beautiful photos of the city. The Cloth Hall (in Polish "Sukiennice"), built in the 14th century, was formerly Krakow's international trade centre. After a century, before being destroyed by a fire, the hall saw its glory days and sold a variety of exotic imports - such as leather, spices and silk - from the East. Located right in the middle of the Market Square, this icon of the city was remodelled in the Renaissance style and listed as a UNESCO World Heritage site in 1978. Nowadays, the Cloth Hall hosts a number of souvenirs and handicrafts shops, on the ground floor, and the 19 Century Polish Art Gallery, on the first floor. A tour of the Gothic castle and cathedral on Wawel Hill is essential for any visitor to the city. See the bones of Smok Wawelski, the mythical dragon of Wawel Hill. The Castle itself, where Polish Kings ruled, offers enough to keep visitors interested for the remainder of their trip up Wawel. This is a sobering sight for visiting tourists, but harrowing and essential for any visit to Krakow. 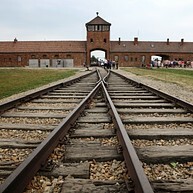 You can catch a bus for a 90-minute journey to the former Nazi concentration camp, where millions of Jews were exterminated during the Second World War. Most travel agents organise day excursions to the camp. 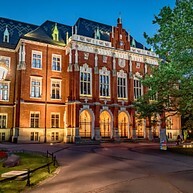 The Museum is about 2 km from the train station Oświęcim, and can be reached from there by local buses. Church of St. Adalbert is located to the side of the Main Market Square in Old Town, and is one of the oldest stone churches in Poland. Its almost thousand-year old history goes back to the beginning of the Polish Romanesque architecture of the early Middle Ages. Rynek Główny is the name for the Main Market Square, which once was the largest square in Medieval Europe. It lies at the heart of the city and has been its hub, ever since the historical district of the Old Town got its present grid of streets in the 13th century. Rynek Główny is still very much the soul of the city. Kazimierz is the old Jewish district where the city’s Jewish population have lived for over 500 years. 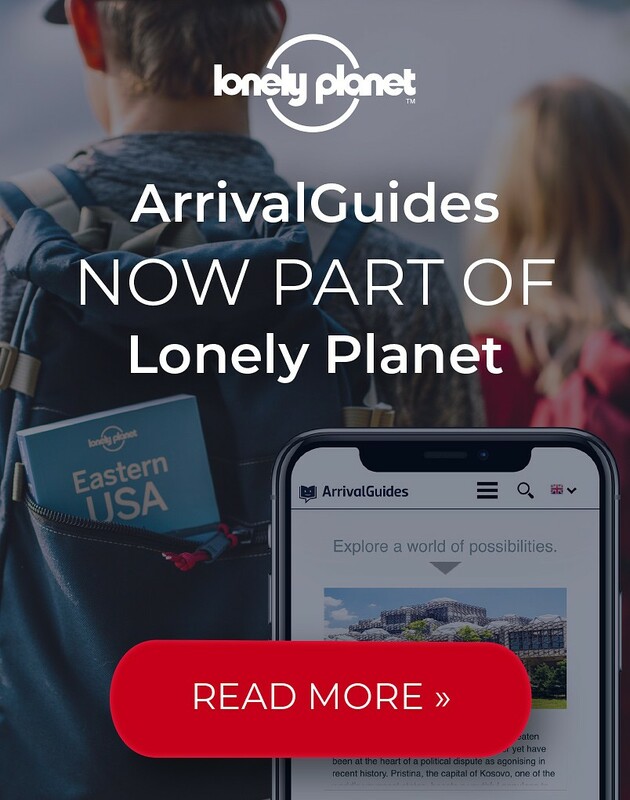 It is an ideal place to experience some of Krakow’s Jewish culture and history. You will also find a range of cafes and restaurants, along with many museums, synagogues and cemeteries. The Czartoryski Museum houses a vast collection of ancient works of art from Greece and Egypt, but the key artworks here have to be Leonardo Da Vinci’s "Lady with an Ermine” and Rembrandt’s “Landscape with the Good Samaritan”. 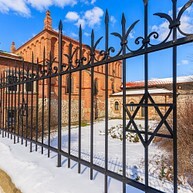 This 15th-century Synagogue houses a permanent exhibition entitled "The Tradition and Culture of Jews in Krakow", as well as temporary exhibitions, in the historic Jewish quarter of Kazimierz. The area surrounding the synagogue has been highlighted in Steven Spielberg’s movie "Schindler’s List." This is the last surviving part of the former 14th-century town hall. It has become, accidentally, the city’s own leaning tower, as it bends slightly off-centre by 55 centimetres, apparently caused by the wind and the passage of time. 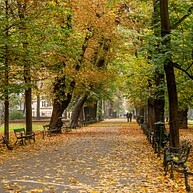 The Planty Park is a 4-kilometre long, horseshoe shaped park that encircles the Old Town. This is a perfect place for a relaxing stroll or a lunch on one of the many benches in the shadow, to take a pause from the daily sightseeing. This is one of the few surviving parts of the ancient defence system that once surrounded the Old Town. Built in the early 14th century, it was the main defence of the north. 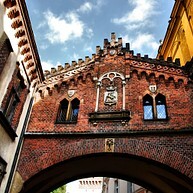 Further towers were added in the 15th century, but the Florian's Gate is the only remaining gate from the original eight. In 1660, it was extended to include a Baroque roof, raising its height by one metre, and today it measures around 33.5 metres. Founded in 1364, this is one of the oldest universities in Europe, and it can boast names like Nicolaus Copernicus and Pope John Paul II among its alumni. To learn more about the history and campus life, you can take a guided tour. The building is centrally located, close to the Main Market Square. This indoor water park is fun for the whole family. There are water slides, Jacuzzi, climbing walls, swimming pools and, when you get hungry after all fun, it is possible to get some food and drinks in the restaurant and cafe. This is the oldest botanical garden in Poland, having been in operation since 1783. Here, you will find several greenhouse complexes, a tropical greenhouse with approximately 50 species of palms and a museum. The National Museum provides a huge collection of objects, including almost 780,000 pieces, and visitors can admire artefacts from every period of history: the oldest date from prehistoric times. The museum also houses art works from different ages and countries, among which you will find Polish art, Western European works and an extremely valuable collection of oriental art, the most of which is Japanese.